The Paulick Report is once again on the sales grounds with a special print publication for the Keeneland April sale of 2-year-olds in training and horses of racing age. 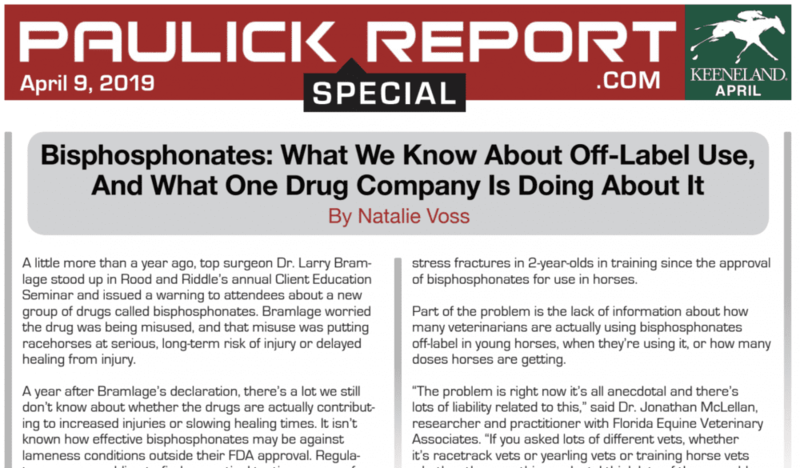 In this edition of the PR Special, Natalie Voss looks into the hot issue of bisphosphonates, going into detail about the drugs and one of the companies that sells them. Bloodstock editor Joe Nevills turns the Stallion Spotlight on the first juveniles of Ashford Stud stallion Competitive Edge and tells the story of Keeneland April grad and two-time Breeders' Cup champion Roy H. Plus, a few hip numbers to pay close attention to at this year's sale in Ten to Watch. In Ask Your Insurer, equine insurance expert Bryce Burton answers a question about providing coverage for new sires, and Dr. Steve Reed responds to an inquiry on solving the mystery of a horse's poor performance in Ask Your Veterinarian. Click here to read this Keeneland April Sale edition of the PR Special. This entry was posted in PR Special, Ray's Paddock and tagged Ask Your Insurer, Ask Your Veterinarian, bisphosphonates, competitive edge, joe nevills, keeneland april, keeneland april sale, Natalie Voss, PR special, roy h, Thoroughbred Auctions, thoroughbred sales by Paulick Report Staff. Bookmark the permalink.